Julius Caesar was born on July 12, 1100 B.C. Historians will tell you that he was one of the greatest military leaders that ever lived. Fortune would strike Julius when his aunt Julia married General Marius. Marius held the position of consul (president) at the time. After a few years, Julius would marry Cornelia. Cornelia was the daughter of one of Marius' most respected lieutenants. At the time, Rome was under control of the dictator Sulla. Sulla ordered Julius to divorce Cornelia. Julius responded by fleeing the area. Shortly following Sulla's death in 78 B.C., Caesar came home. Then, after a short stay, he again left, only this time he set sail for the island of Rhodes to study public speaking. Unfortunately, he was kidnapped by pirates. Julius was eventually freed for 12,000 gold pieces, but not before promising to get even with the kidnappers. He kept his word, Julius crucified each one of them. Caesar rose rapidly to the pinnacles of the Roman government. He held almost every important political office. First he was elected tax collector (quaestor) in 69 B.C., then in 65 B.C., he was elected to a post that placed him in charge of public buildings (aediles). In this post he gained in popularity because he spent huge sums of money on sporting events. Then in 63 B.C., he was elected to the highest religious position in Rome, ponitifex maximus. In 59 B.C., Julius was accused of bribing his way into the highest held office, a counselship. Shortly after winning the election he called on his two allies, Crassus, and Pompey. Caesar suggested that the empire be divided into three parts, as long as they each defended the interests of the others. This agreement was called the First Triumvirate. At the time, Caesar knew the arrangement would only last as long as they each attained riches. In 58 B.C., Julius led one military campaign after another against western Europe. The fighting would last for ten years. His success expanded the Roman Empire into parts of Germany, France, and the British Isles. Then in 53 B.C., the First Triumvirate would collapse when Crassus was killed in a battle in northern Mesopotamia. At this time, Pompey campaigned for total control of Rome, and he was successful. However, his success would be short lived as Julius was on his way home. The moment Caesar and his troops arrived in Rome, Pompey's followers ordered Julius to surrender his command. Julius refused. Instead, Julius and his troops defeated Pompey in a civil war. Julius went to Egypt in 47 B.C., and fell in love with Cleopatra. He would stay long enough to defeat the King of Egypt, and make Cleopatra queen. From then on, Egypt would serve as a client state of Rome. When Caesar finally returned to Rome, the empire was his. They made him dictator for life. 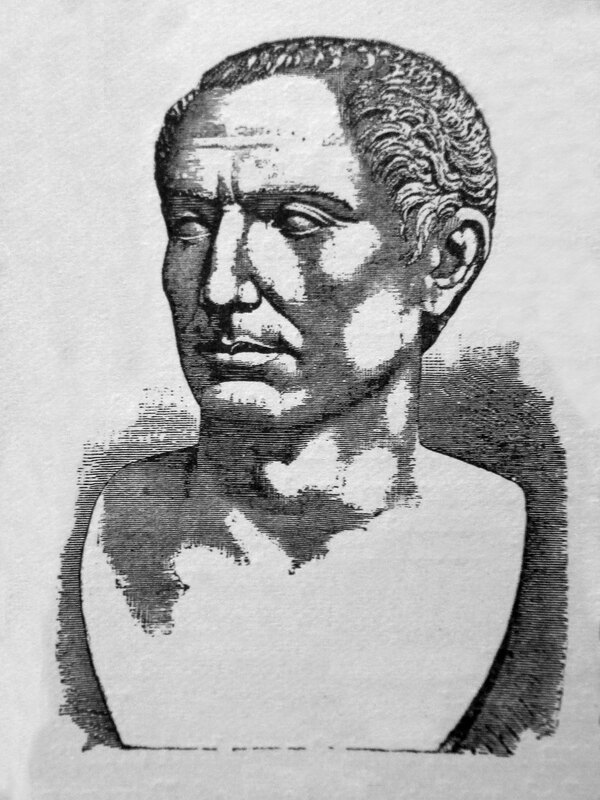 Julius Caesar spent much of his career working on reforms. He especially wanted to help the landless poor and his former soldiers. Caesar made a lot of enemies because of his reforms. He especially was disliked by the two leading members of the Senate, Cassius and Marcus Brutus. On March 15, 44 B.C., while the senators gathered for a meeting at Pompey's theater, Julius was stabbed to death. His body fell crumpled next to a statue of Pompey, his old rival.